First flight from Brooklands to Wisley. 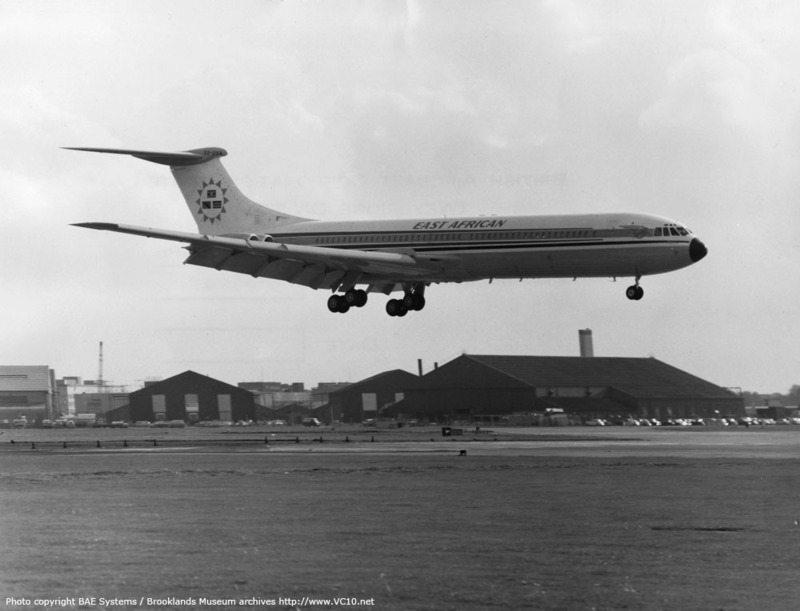 A set of Conway 540 engines was borrowed from a Standard VC10 for this flight as the 550B engines were not ready yet. 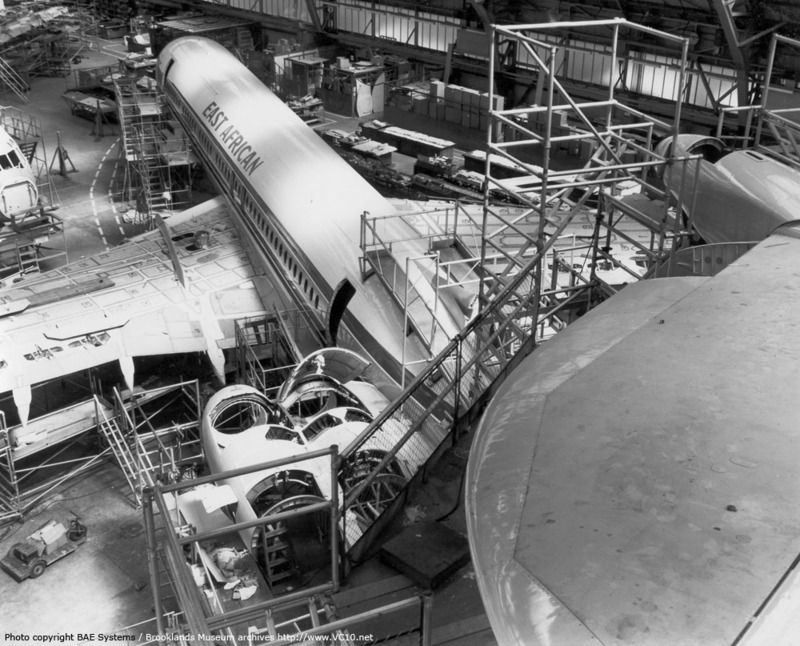 September 1966 Carried out a Performance Guarantee flight prior to acceptance. Took off from London Airport with full fuel and flew between Le Havre and Stornoway carrying out cruise climb procedures. 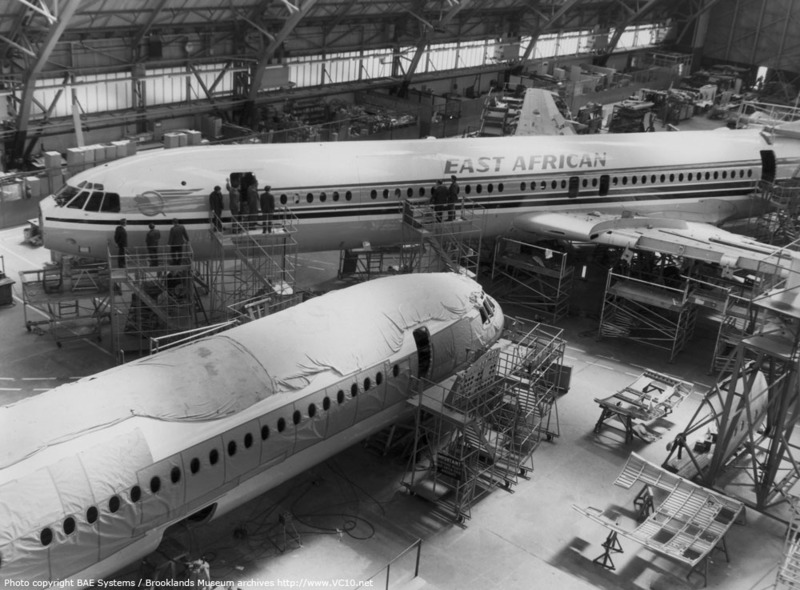 30 September 1966 Delivery to EAA as 5X-UVA, registered in Uganda. A festive ceremony was held at Wisley for the occasion. 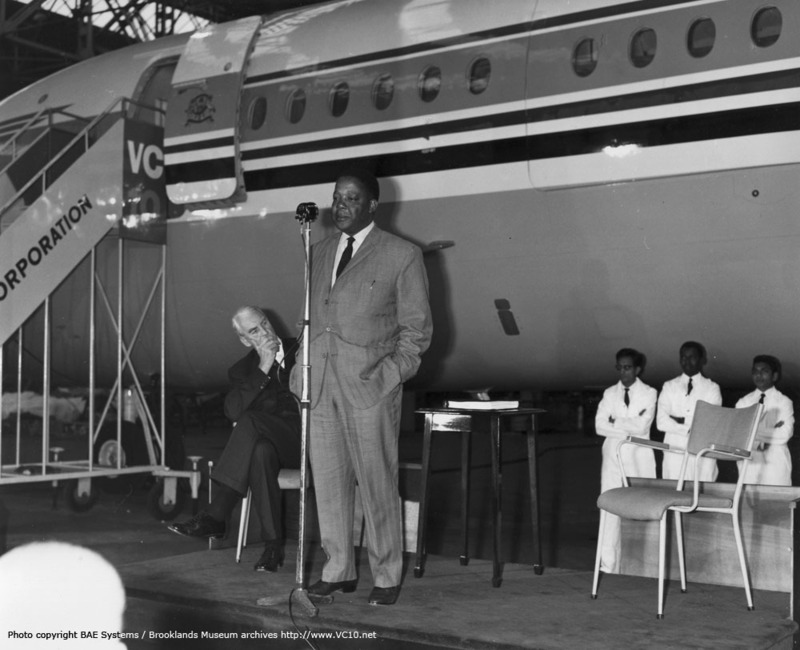 11 October 1966 Delivery flight from Heathrow with Captain G.W. Mitchell (EAA chief instructor SVC10) and Lew Roberts (BAC). Delayed by an hour as not all the guarantees for the lease/purchase agreement were in place. Flew to Nairobi via Rome and Cairo. 13 October 1966 First scheduled service by EAA Super VC10. 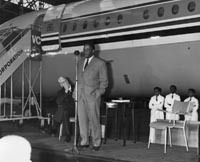 7 September 1967 Left Nairobi at 13:00 for first proving flight to Hong Kong, via Addis Ababa, Karachi, Bombay and Bangkok. 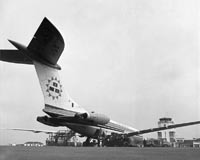 Captain Reg Cartwright carried out the first ever landing of a Super VC10 at Kai Tak airport and also the first landing of an EAA aircraft there. Left again after five hours on the ground and routed over Da Nang at 36,000 feet to stay clear of B-52 bombers carrying out missions from Guam. 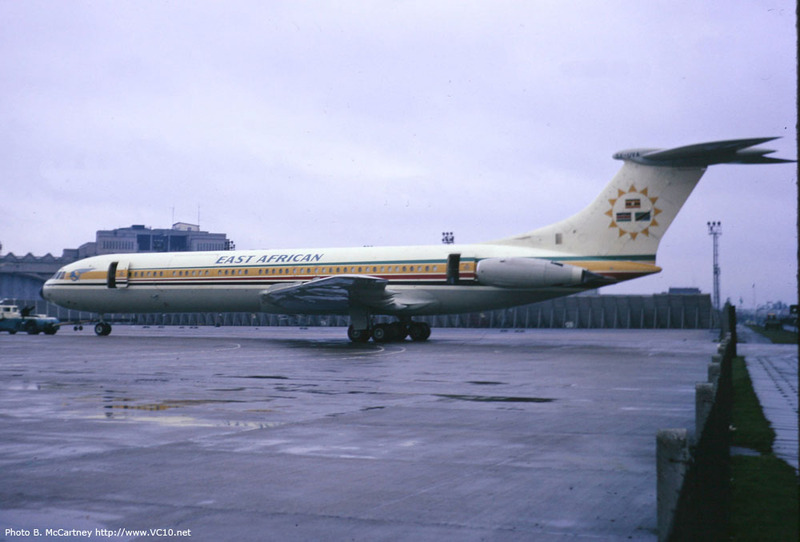 18 April 1972 Destroyed during take off accident at Addis Ababa. 1. 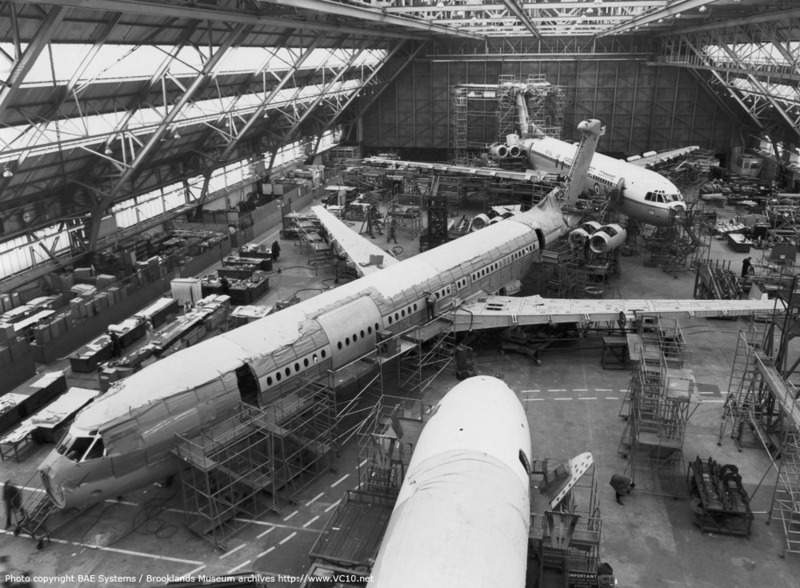 5X-UVA seen in the flight sheds at Weybridge during final assembly alongside two RAF VC10s. 2. 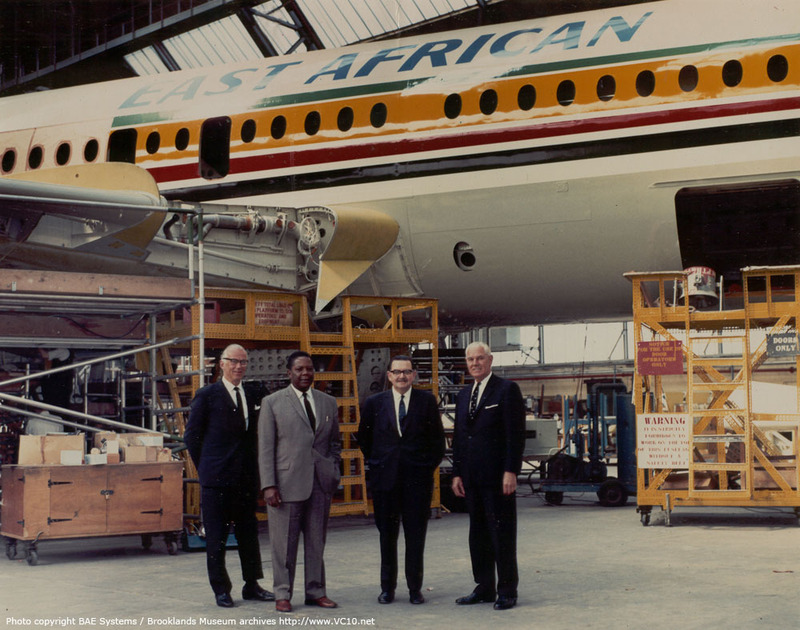 With the aircraft looking a bit more complete, a delegation from EAA visits for an inspection. 3. 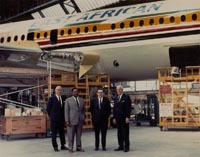 Chief Fundurika (2nd from left) was the head of EAA when the VC10s were ordered. 4. 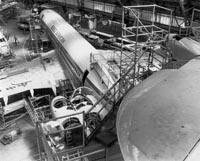 This view from above the tailplane shows that the engines have yet to be installed. In the end a set of Conway 540s borrowed from a Standard VC10 was used for the first flight as there were no Conway 550Bs available yet. 1. 5X-UVA taxiing at Brooklands before its first flight. 2. 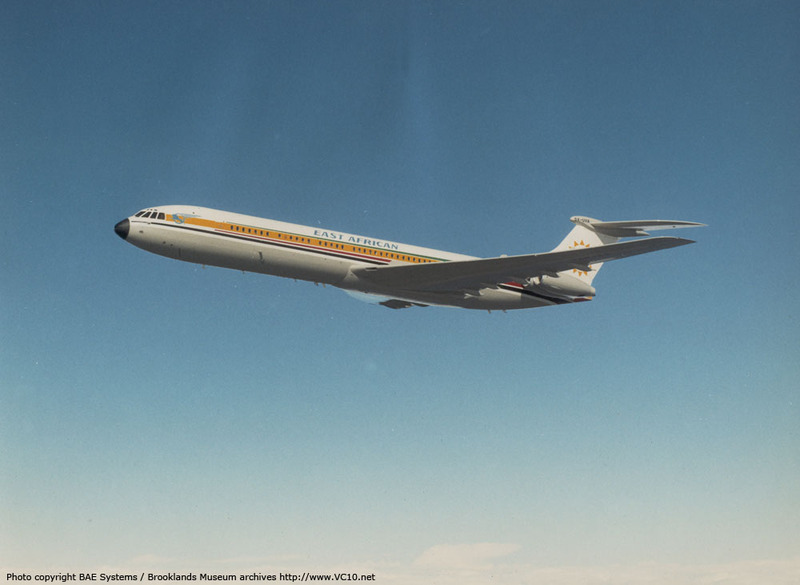 After its first flight rest of the testing program was conducted from Wisley. 3. EAA's first VC10 was the subject of an air-to-air photo session. 4. These images would turn up in many places for publicity purposes. 1. 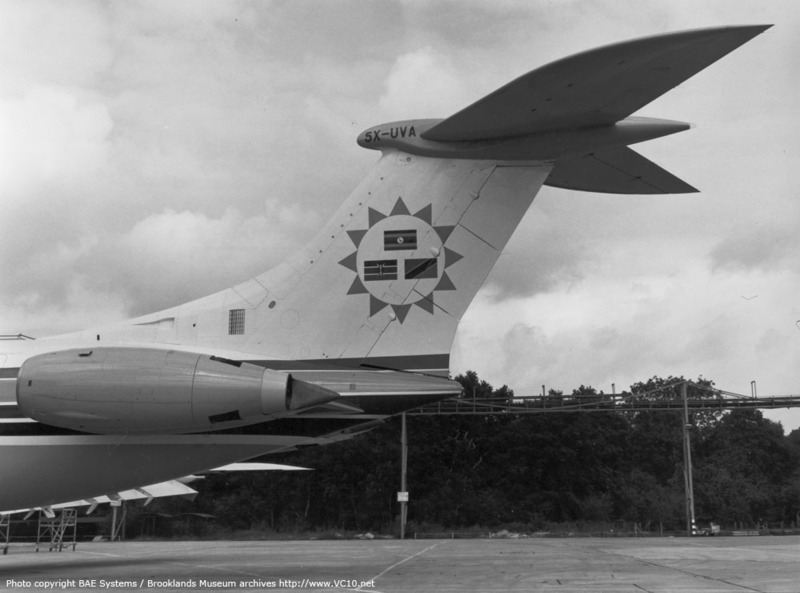 The handover of this first Super VC10 to EAA was carried out with some ceremony at Wisley. 2. 5X-UVA landing at Heathrow airport. The black building is the British Eagle hangar, TBK is at the far left. 3. 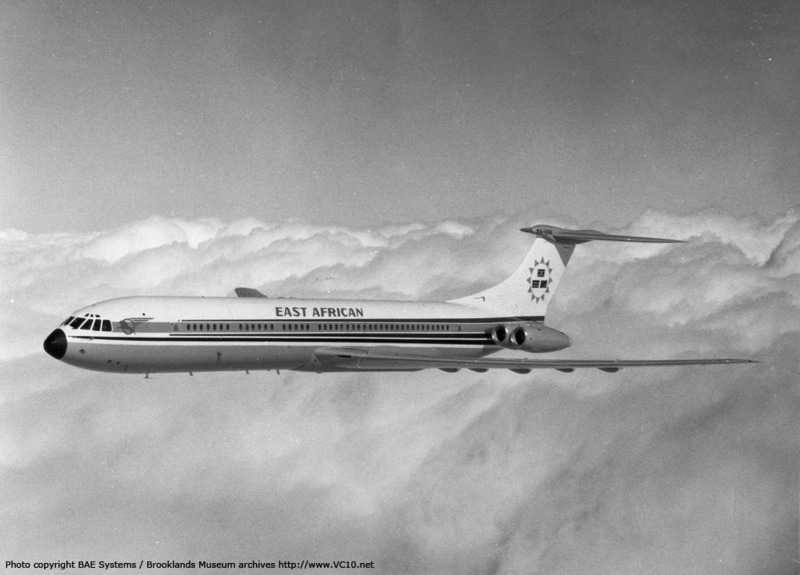 EAA's first Super VC10 at Entebbe. 4. 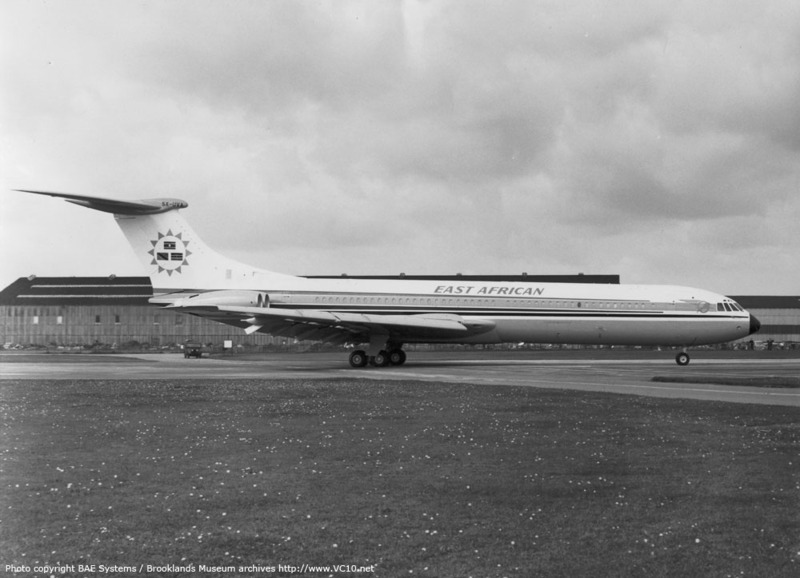 5X-UVA spotted at Heathrow on 27 January 1967. 1. 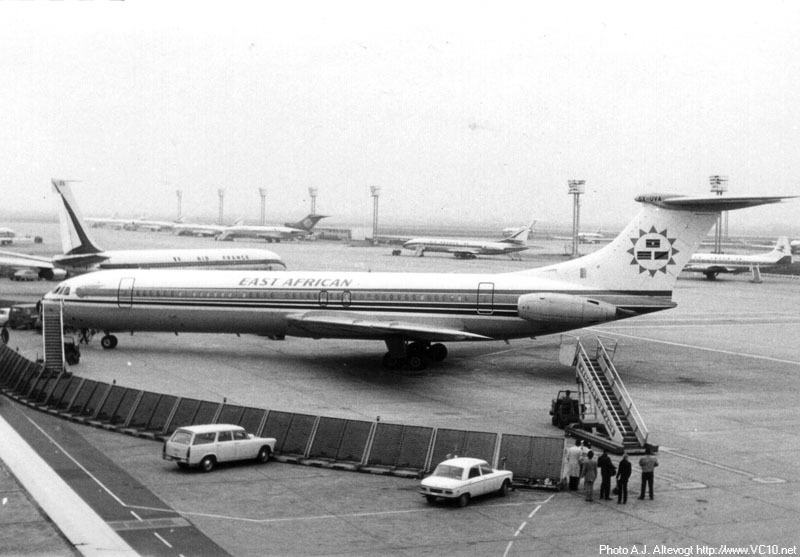 5X-UVA seen at Paris Orly Airport on 7 June 1969.